Leave your mom jarred this Mother’s Day! Naturally, we will encourage you to place your Mother’s Day gift order for nationwide delivery via NetFlorist BUT, we’re also always interested in bringing you other gifting solutions. A common, inventive and money-saving gifting option is always DIY. Pinterest is packed with DIY projects that the recipient of your gift is bound to appreciate, but is ‘appreciate’ enough for you? Wouldn’t you rather love to leave your gift recipient absolutely jarred? Wash away those troubles and have a soak with bubbles. 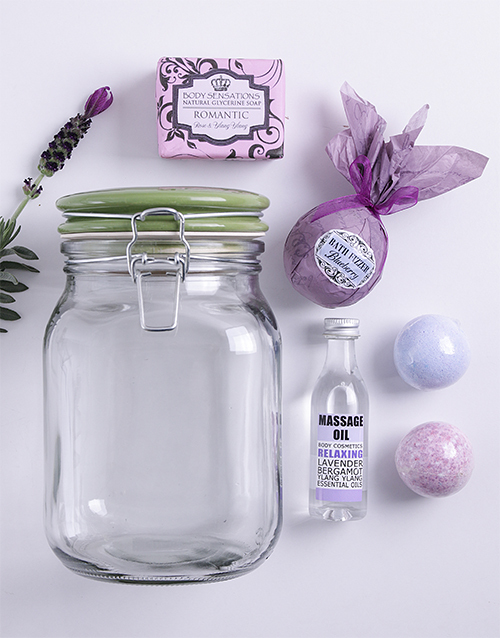 Spoil a loved one to the perfect bath time treat – small round glass keepsake jar filled with a large bath fizzer, 2 medium fizzers, a body sensations soap and a massage oil. There is really no other way to enjoy a bath. Send this pamper hamper with NetFlorist today! Mother’s Day is around the corner, which means that you have less time to find the perfect gift for the special occasion. It is incredibly difficult to find a gift that shows your mom the respect and appreciation she deserves; one gift simply doesn’t sum up the roles she has played throughout the course of your life. So, although it is is nearly impossible to find that one gift that does it all, we can always try our hardest. 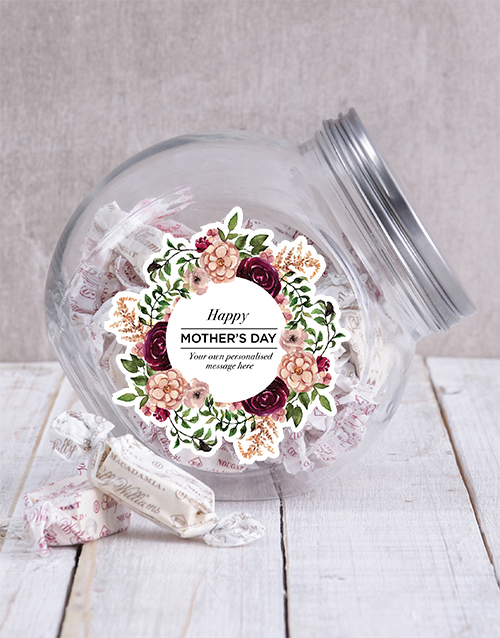 If you want to keep your mother happy this Mother’s Day, surprise her with our Personalised Nougat Mother’s Day Candy Jar. The jar is bound to satisfy her sweet tooth. Order this personalised candy jar with her name on it and have it delivered in a medium gift box. Consider skipping the traditional gift wrapping route and rather opt for a jar. There are numerous online tutorials that instruct you how to assemble a gift jar. We’ve taken the time to comb through those articles and select the top DIY options specifically suited for Mother’s Day. Below are our top three picks. We have, however, decided to add some of our favourite ‘jarred’ gifts to the article just in case you decide that DIY just isn’t for you! She has spent countless hours running after you and your family. She works herself to the bone trying to balance work, family and regular household chores. Your mom, without a doubt, deserves to be treated to some pampering. Do so in the form of this Spa in a Jar! Bath bomb and bubble bath. Add your own personal touch this Mother’s Day with this Personalised Mothers Day Fruit Jar Set. Two jars have been filled with dried and diced strawberries, macadamia nuts, and speckled eggs. 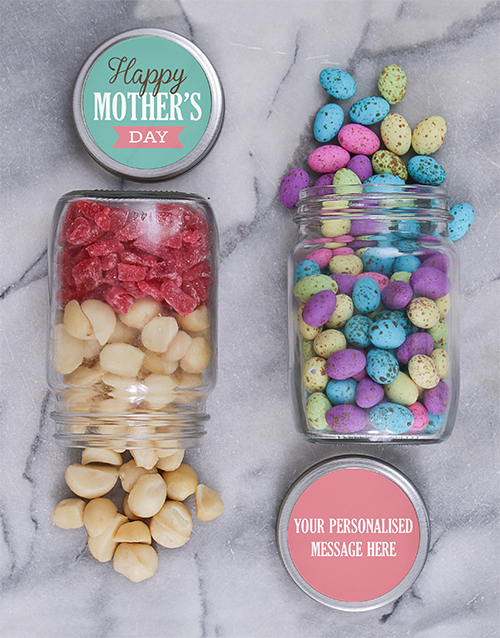 One jar’s lid reads, ‘Happy Mother’s Day’ and the second is available for personalisation. Add your personal touch with a special message for your mother. The jars are neatly and safely packaged in a gift box. South Africa is officially in autumn but winter is fast approaching! Here is a winter survival kit that is everything your mom didn’t know she needed! This is the ultimate gift for mom this Mother’s Day. Hand cream and lip balm to combat the dry air. Hot chocolate sachets and mini-marshmallows for garnish. Hand sanitiser, because washing your hands can be quite a challenge with the water being so cold. 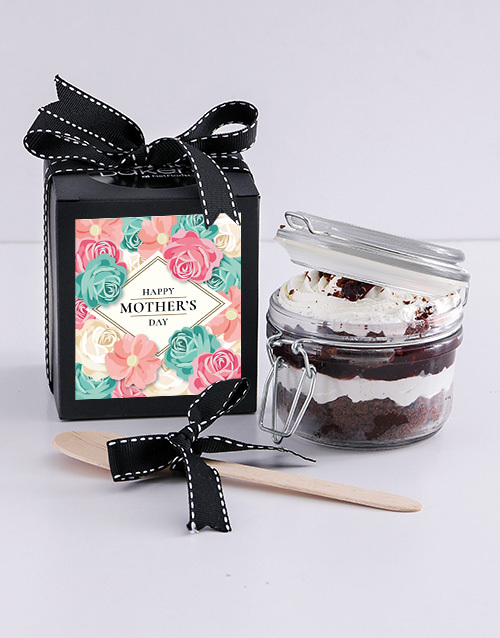 Wish mom a Happy Mother’s Day with an individual Black Forest Cupcake Jar which is filled with layers of chocolate cake and a sweet cream filling, which is then layered and topped with a black cherry filling and shaved dark chocolate. This yummy treat is packed in a black keepsake box with unique ‘Happy Mother’s Day’ label. Allergens: wheat, gluten, cow’s milk, egg and dairy. This product may contain nuts. This Mother’s Day gift is both inventive and practical. As your mother will most likely be the one to sew that loose button back on or hurriedly fix that loose hem, this portable sewing is sure to come in handy! Kit the jar out with sewing essentials but choose to go the extra mile when it comes to the pincushion. Surprise your mom by transforming the lid of the jar into a pincushion! A clean jar with ring and snap lid. A small, colourful piece of material. 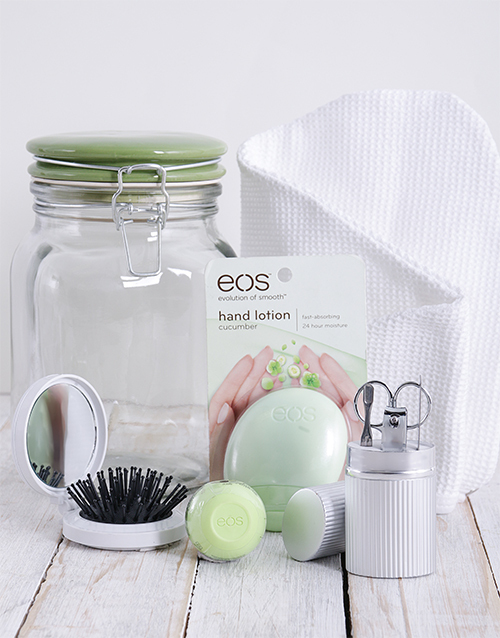 Make her feel extra pampered with this amazing hamper which consists of a compact mirror and hair brush, a white turban head wrap, a manicure set, EOS lip balm, and EOS hand cream, all packed into a 2-litre glass jar! This unique gift will make any gal’s day! There is certainly no harm in opting to take the easy way out. Seriously, you will find no judgement here! Scroll through our Mother’s Day range and simply place your order for delivery. Order before 9 May 2018 and NetFlorist will throw in a free box of Lindt chocs. Do all of this from the comfort of your device!